•A tool for transferring various RivEX generated metrics to a chosen point layer. What is available to transfer depends upon what attributes you have encoded into your network using RivEX. 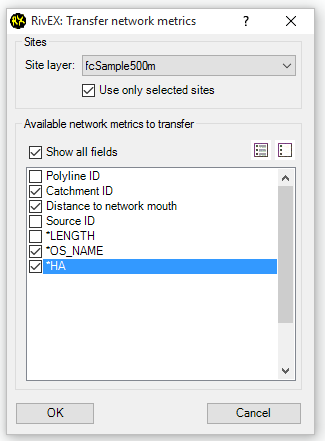 The advantage of this tool over the Spatial Join tool is that it does not generate a new dataset, it updates the point dataset by adding fields and transferring the network values. •If you tick on Show all fields it will display all fields in your river network, these are highlighted with an asterisk to distinguish them from fields generated by RivEX. •Your point layer must be snapped to the network, RivEX has a tool here to snap points to network. •If a selection on the site layer exists RivEX will enable the check box Use only selected sites. If you need to process only a sub set of your sites in the layer then make sure you check this. •Tick at least one metric to transfer and press OK to execute the tool. •RivEX will process sites that intersect the polylines of the network. If any are found not to be intersecting it will drop these from the analysis and the ID's written to an error log file. The error log file is written to ..\RivEX_Workspace\ErrorLogs\FailedSites.txt. •Each valid site will have the values transferred from the network. The field names and field types are "cloned" from the network layer. In addition to any user selected fields the fields DistFromLn and DistAlngLn are added. DistFromLn is the distance from line which should always be ZERO. DistAlngLn is the distance along the individual polyline as a ratio value. •If you are transferring the RivEX generated fields Distance to network mouth and Upstream length RivEX will return the correct distance; they are adjusted using the position of the site along the polyline.